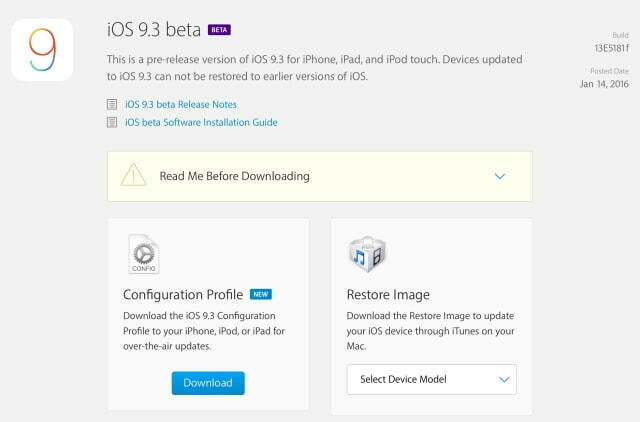 Apple has released iOS 9.3 beta 1.1 to developers for testing. The build number is 13E5181f. devices to freeze on the Apple logo. ● Fixed: Starting an app that uses compass data on a device that doesn’t include a motion coprocessor (that is, iPhone 5c and 5, iPad 2, iPad mini and earlier), causes locationd to crash for as long as the compass request continues. Also, Camera photos are not geotagged.